As with all nature parks, weeds are a significant problem on Mount Majura. Weeds are nuisance plants growing in the wrong place. Suburban gardens are the source of many of the weeds found in the bushland of Mount Majura. Birds carry the seeds of plants – such as pyracantha, cotoneaster, firethorns, hawthorns, olives, privet, roses – into the Nature Park, where they germinate and thrive. We know these plants as ‘woody weeds‘. 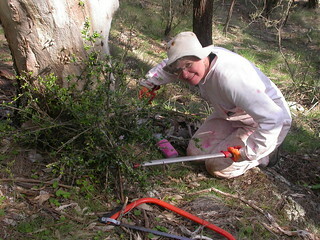 We remove these weeds by hand during regular (monthly) weeding parties, held on Sunday mornings, from September to May. As well as serving an ecological purpose, these are social occasions. A history of sheep grazing on Mount Majura has also left a legacy of pasture weeds such as horehound and Johnson’s grass. Our members have been valiantly removing horehound from a former sheep ‘camp’ near the summit.